Engineers can tell why certain roads and buildings collapsed in Friday’s earthquake without even going to visit. “Some of them, we can just look at the picture in the paper and say, ‘Yep, that’s why that failed,’” said Ross Noffsinger, the acting municipal building official — a job that puts him in charge of enforcing the building code. 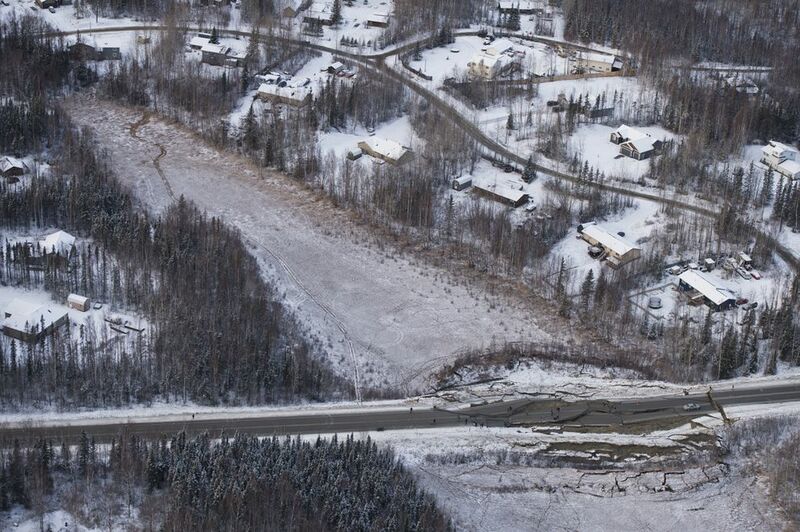 In areas where roads cross wetlands, failure can occur when shaking liquefies soils underneath, said Kyle Brennan, who leads geotechnical engineers for Shannon & Wilson in Anchorage and is vice chair of the city’s Geotechnical Advisory Commission. But that doesn’t necessarily mean anyone made a mistake. Construction that can withstand a strong earthquake may be too expensive for low-hazard infrastructure like roads, which are relatively easy to fix. Engineered facilities that failed may have been built to fail in a quake this strong. Under Anchorage’s odd form of local government, areas can choose a menu of services. Eagle River never opted into the Building Safety Service Area, where Noffsinger’s office has authority. “We’ve heard anecdotal evidence for years that the construction that was taking place outside the Building Safety Service Area was less than structurally code compliant,” Noffsinger said. That matters. 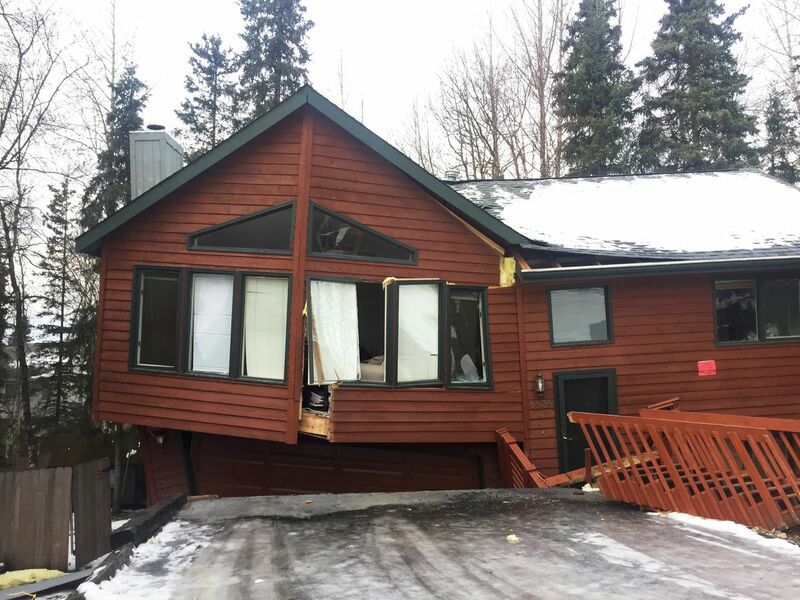 Anchorage plan reviewers check calculations on every house or commercial building to make sure the design accounts for lateral shaking forces, among other issues. Inspectors then verify that work is done as shown in the plans. 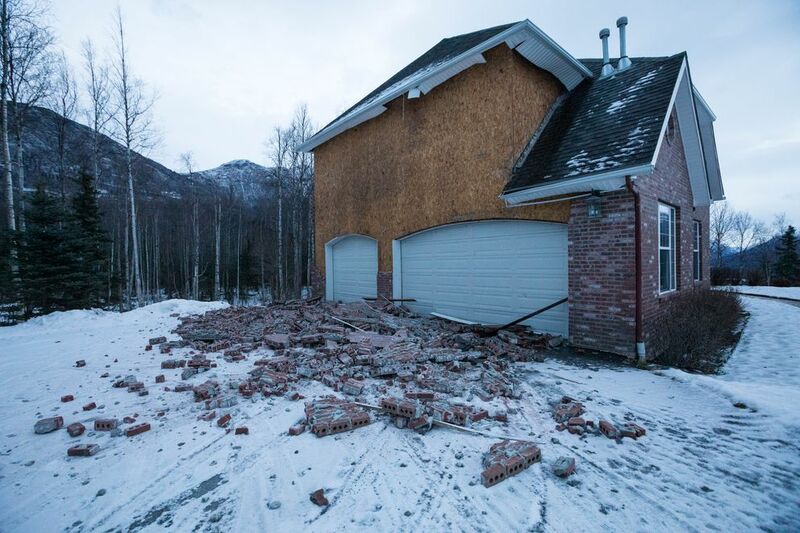 In Anchorage, prone to high winds and earthquakes, even modest homes need shear walls to stiffen against those forces. The need isn’t obvious unless you understand the physics. Shear walls must be specifically located and oriented and securely attached to the foundation with stout bolts. Within the building safety area, few buildings sustained catastrophic damage. Injuries were rare. Those houses that were damaged may have been unlucky with the soils underneath. Brennan said geotechnical investigation is not required for single-family houses in Anchorage except in areas designated as having high risk of ground failure. Geotechnical engineers do study sites of all commercial buildings. Drilling reveals the strength of soil. Some tests can be done on site, but Brennan’s team also brings core samples into the lab to determine its detailed physical properties. Calculations based on those measurements determine the stability of a site and inform structural engineers how strong a building must be. Bob Bell, retired from his own Bell and Associates engineering firm, said some buildings along bluffs downtown were constructed on soil known to liquefy when shaken. But engineers designed the buildings to stay in one piece if they slide down the hill in an earthquake, so the occupants would survive. Bell said utilities recovered rapidly in Anchorage thanks to engineers studying soils. Where pipes pass through different types of soil, expected to move differently in a quake, engineers specify stiffening structures and layers of gravel that would move with the pipe, preventing breaks. Brennan believes the Nov. 30 quake did not last long enough to liquefy the Bootlegger Cove clay under the West Anchorage bluffs, which caused most of the damage in the much longer 1964 Good Friday earthquake. Shaking soil moves water between the grains. In permeable material, such as gravel, the water can move without affecting the soil much. But in clay, water pressure builds as shaking continues, until it reaches a critical point and breaks the bonds between particles. That’s why earthquake duration matters so much with our clay. Brennan and Bell both recognized the types of ground failures shown in photographs of damaged roads. 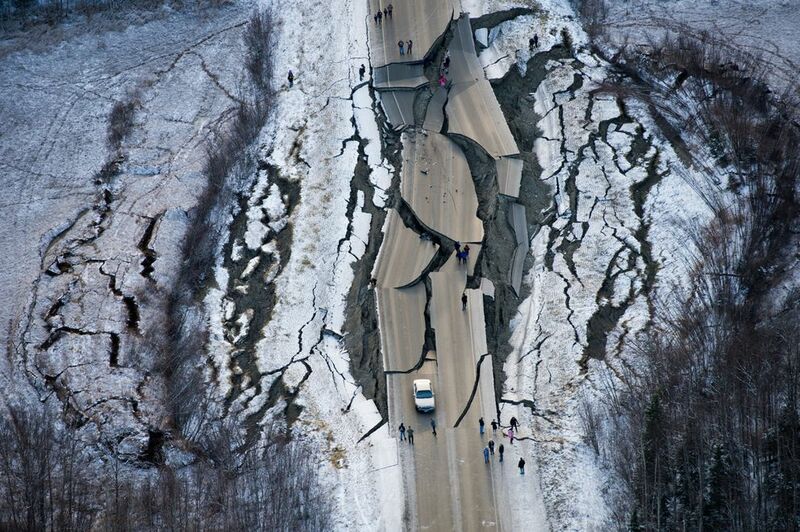 The now-famous Vine Road, in the Mat-Su area, collapsed where it crossed a swamp. Saturated soils liquefy easily in a shake. But if roads were under-engineered for a 7.0 earthquake, that may have been a good decision, they said. A similar consideration explains why geotechnical investigations don’t precede construction of most single-family houses. “You would build houses nobody could afford to buy,” Brennan said. Instead, we have building codes that take into account the possibility of weak soils and keep the occupants safe even if the structure is damaged. Plywood construction is strong and light. The boxy cottages of Turnagain that went into Cook Inlet during the 1964 quake held together, even after falling into fissures. Deaths were few. Houses today are much more complex. Noffsinger said reviewing plans for a big, custom home can take longer than for a much larger commercial building. But safety continues to improve thanks to the knowledge and experience of engineers, plan reviewers, craftsmen and inspectors. The good results in Anchorage attest to that. From my time in local government, I know builders complain constantly about permitting, plan review and inspections. No one likes the time and expense of submitting plans or waiting for inspectors. Hefty permit fees pay for the program. Besides that inconvenience, self-reliant, independent Alaskans don’t like to be told what to do. Democracy works, and in most of Alaska you have the freedom pretty much to build what you want how you want, if someone will loan you the money. I get that. I built structures at my cabin and I didn’t follow government rules. But if my cabin falls down, I won’t expect anyone to help me pay for the damage. Likewise, areas without building code enforcement should not expect government support for repairs of private property until they adopt codes and employ plan reviewers and inspectors. The earthquake last week proved the local government formula for keeping people safe. If you don’t use that formula, the outcome is on you.